How is swine flu transmitted? Is swine flu contagious? What is the incubation period for swine flu? What is the contagious period for swine flu? How long does the swine flu last? Why is swine flu now infecting humans? What are swine flu symptoms and signs? What types of health care professionals treat swine flu? What tests do health care professionals use to diagnose swine flu? What is the treatment for swine flu? What is the history of swine flu in humans? Is it possible to prevent swine flu with a vaccine? Is it possible to prevent swine flu if the swine flu vaccine (or other flu strain vaccines) is not readily available? Are there home remedies for swine flu? Was swine flu (H1N1) a cause of an epidemic or pandemic in the 2009-2010 flu season? What is the prognosis (outlook) and complications for patients who get swine flu? Where can I find more information about swine flu (H1N1 and H3N2v)? Swine flu is a respiratory disease caused by influenza viruses that infect the respiratory tract of pigs and result in a barking cough, decreased appetite, nasal secretions, and listless behavior; the virus can be transmitted to humans. Swine flu viruses may mutate (change) so that they are easily transmissible among humans. The April 2009 swine flu outbreak (pandemic) was due to infection with the H1N1 virus and was first observed in Mexico. Symptoms of swine flu in humans are similar to most influenza infections: fever (100 F or greater), cough, nasal secretions, fatigue, and headache. The incubation period for the disease is about one to four days. Swine flu is contagious about one day before symptoms develop to about five to seven days after symptoms develop; some patients may be contagious for a longer time span. The disease lasts about three to seven days with more serious infections lasting about nine to 10 days. Vaccination is the best way to prevent or reduce the chances of becoming infected with influenza viruses. Primary care specialists, pediatricians, and emergency-medicine doctors usually treat the disease, but other specialists may be consulted if the flu is severe, complicated, and/or life threatening. Four antiviral agents, zanamivir (Relenza), oseltamivir (Tamiflu), peramivir (Rapivab), and baloxavir marboxil (Xofluza), have been reported to help prevent or reduce the effects of swine flu if taken within 48 hours of the onset of symptoms. Some researchers disagree and suggest the antiviral agents have no effect. There are various methods listed in this article to help individuals from getting the flu. Home remedies are available, but patients should check with their doctors before use; over-the-counter medications may help reduce symptoms. The most serious complication of the flu is pneumonia. If you've got fever, cough, or one of the other symptoms of the flu, you may be wondering if you have contracted the H1N1 swine flu virus. The reality is that it isn't possible to know unless specialized testing is ordered, and for uncomplicated cases of the flu in non-hospitalized patients, routine testing for the H1N1 virus is not being carried out. Swine flu (swine influenza) is a respiratory disease caused by viruses (influenza viruses) that infect the respiratory tract of pigs, resulting in nasal secretions, a barking cough, decreased appetite, and listless behavior. Swine flu produces most of the same symptoms in pigs as human flu produces in people. Swine flu can last about one to two weeks in pigs that survive. Swine influenza virus was first isolated from pigs in 1930 in the U.S. and has been recognized by pork producers and veterinarians to cause infections in pigs worldwide. In a number of instances, people have developed the swine flu infection when they are closely associated with pigs (for example, farmers, pork processors), and likewise, pig populations have occasionally been infected with the human flu infection. In most instances, the cross-species infections (swine-origin virus to man; human flu virus to pigs) have remained in local areas and have not caused national or worldwide infections in either pigs or humans. Unfortunately, this cross-species situation with influenza viruses (human infections with swine viruses) has had the potential to change. Investigators decided the 2009 so-called "swine flu" strain, first seen in Mexico, should be termed novel H1N1 flu since it was mainly found infecting people and exhibits two main surface antigens, H1 (hemagglutinin type 1) and N1 (neuraminidase type1). The eight RNA strands from novel H1N1 flu have one strand derived from human flu strains, two from avian (bird) strains, and five from swine strains. The main swine flu viruses in pigs in the recent years are swine triple reassortant (tr; it means a viral strain with genes from three different organisms) H1N1, trH3N2, and trH1N2. However, in August 2018, China first reported a new swine flu outbreak in pigs in Liaoning province. The pig flu strain known as African swine flu (although some researchers think it originated in Russia), almost 100% fatal to pigs, was the cause. This strain is highly infectious, survives in heat and cold environments, and can remain viable and infectious on surfaces for days to weeks. Currently, there is no effective vaccine or drug to stop its spread, so the disease is treated by immediate slaughter of infected pigs. China has about 50% of the world's pig population and relies on pork to provide a large amount of protein for the Chinese population. Culling the pig population in China may result in China needing to import pork that would likely be a large economic blow to China's economy. This virus has not yet been detected in the U.S. This flu strain reportedly does not spread to humans. Swine influenza is transmitted from person to person by inhalation or ingestion of droplets containing virus from people sneezing or coughing; it is not transmitted by eating cooked pork products. The newest swine flu virus that has caused swine flu is influenza A H3N2v (commonly termed H3N2v) that began as an outbreak in 2011. The "v" in the name means the virus is a variant that normally infects only pigs but has begun to infect humans. There have been small outbreaks of H1N1 influenza since the pandemic; a recent one is in India where at least three people have died. The incubation period for swine flu is about one to four days, with the average being two days; in some people, the incubation period may be as long as about seven days in adults and children. The contagious period (human-to-human viral infection) for swine influenza in adults usually begins one day before symptoms develop in an adult and it lasts about five to seven days after the person becomes sick. However, people with weakened immune systems and children may be contagious for a longer period of time (for example, about 10 to 14 days). In uncomplicated infections, swine flu typically begins to resolve after three to seven days, but the malaise and cough can persist two weeks or more in some patients. Severe swine flu may require hospitalization that increases the length of time of infection to about nine to 10 days. The cause of the 2009 swine flu was an influenza A virus type designated as H1N1. In 2011, a new swine flu virus was detected. The new strain was named influenza A (H3N2)v. Only a few people (mainly children) were first infected, but officials from the U.S. Centers for Disease Control and Prevention (CDC) reported increased numbers of people infected in the 2012-2013 flu season. Currently, there are not large numbers of people infected with H3N2v. Unfortunately, another virus termed H3N2 (note no "v" in its name) has been detected and caused flu, but this strain is different from H3N2v. In general, all of the influenza A viruses have a structure similar to the H1N1 virus; each type has a somewhat different H and/or N structure. 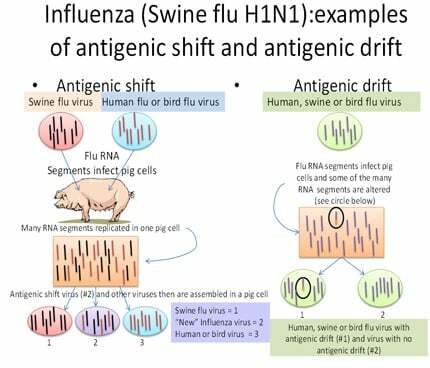 Many researchers now consider that two main series of events can lead to swine flu (and also avian or bird flu) becoming a major cause for influenza illness in humans. First, the influenza viruses (types A, B, C) are enveloped RNA viruses with a segmented genome; this means the viral RNA genetic code is not a single strand of RNA but exists as eight different RNA segments in the influenza viruses. A human (or bird) influenza virus can infect a pig respiratory cell at the same time as a swine influenza virus; some of the replicating RNA strands from the human virus can get mistakenly enclosed inside the enveloped swine influenza virus. For example, one cell could contain eight swine flu and eight human flu RNA segments. The total number of RNA types in one cell would be 16; four swine and four human flu RNA segments could be incorporated into one particle, making a viable eight RNA-segmented flu virus from the 16 available segment types. Various combinations of RNA segments can result in a new subtype of virus (this process is known as antigenic shift) that may have the ability to preferentially infect humans but still show characteristics unique to the swine influenza virus (see Figure 1). It is even possible to include RNA strands from birds, swine, and human influenza viruses into one virus if a single cell becomes infected with all three types of influenza (for example, two bird flu, three swine flu, and three human flu RNA segments to produce a viable eight-segment new type of flu viral genome). Formation of a new viral type is considered to be antigenic shift; small changes within an individual RNA segment in flu viruses are termed antigenic drift (see figure 1) and result in minor changes in the virus. However, these small genetic changes can accumulate over time to produce enough minor changes that cumulatively alter the virus' makeup over time (usually years). Second, pigs can play a unique role as an intermediary host to new flu types because pig respiratory cells can be infected directly with bird, human, and other mammalian flu viruses. Consequently, pig respiratory cells are able to be infected with many types of flu and can function as a "mixing pot" for flu RNA segments (see figure 1). Bird flu viruses, which usually infect the gastrointestinal cells of many bird species, are shed in bird feces. Pigs can pick these viruses up from the environment, and this seems to be the major way that bird flu virus RNA segments enter the mammalian flu virus population. Figure 1 shows this process in H1N1, but the figure represents the genetic process for all flu viruses, including human, swine, and avian strains like H1N2 (bird flu). Symptoms of swine flu are similar to most influenza infections: fever (100 F or greater), cough (usually dry), nasal secretions, fatigue, and headache, with fatigue being reported in most infected individuals. Some patients may also get a sore throat, rash, body (muscle) aches or pains, headaches, chills, nausea, vomiting, and diarrhea. In Mexico, many of the initial patients infected with H1N1 influenza were young adults, which made some investigators speculate that a strong immune response, as seen in young people, may cause some collateral tissue damage. The incubation period from exposure to first symptoms is about one to four days, with an average of two days. The symptoms last about one to two weeks and can last longer if the person has a severe infection. Some patients develop severe respiratory symptoms, such as shortness of breath, and need respiratory support (such as a ventilator to breathe for the patient). Patients can get pneumonia (bacterial secondary infection) if the viral infection persists, and some can develop seizures. Death often occurs from secondary bacterial infection of the lungs; appropriate antibiotics need to be used in these patients. The usual mortality (death) rate for typical influenza A is about 0.1%, while the 1918 "Spanish flu" epidemic had an estimated mortality rate ranging from 2%-20%. Swine (H1N1) flu in Mexico had about 160 deaths and about 2,500 confirmed cases, which would correspond to a mortality rate of about 6%, but these initial data were revised and the mortality rate worldwide was estimated to be much lower. Fortunately, the mortality rate of H1N1 remained low and similar to that of the conventional flu (average conventional flu mortality rate is about 36,000 per year; projected H1N1 flu mortality rate was 90,000 per year in the U.S. as determined by the president's advisory committee, but it never approached that high number). Fortunately, although H1N1 developed into a pandemic (worldwide) flu strain, the mortality rate in the U.S. and many other countries only approximated the usual numbers of flu deaths worldwide. Speculation about why the mortality rate remained much lower than predicted includes increased public awareness and action that produced an increase in hygiene (especially hand washing), a fairly rapid development of a new vaccine, and patient self-isolation if symptoms developed. Almost all uncomplicated patients with swine flu can be treated at home or by the patient's pediatrician, primary care provider, or emergency-medicine doctor. For more complicated and/or severe swine flu infections, specialists such as critical care specialists, lung specialists (pulmonologists), and infectious-disease specialists may be consulted. Swine flu is presumptively diagnosed clinically by the patient's history of association with people known to have the disease and their symptoms listed above. Usually, a quick test (for example, nasopharyngeal swab sample) is done to see if the patient is infected with influenza A or B virus. Most of the tests can distinguish between A and B types. The test can be negative (no flu infection) or positive for type A and B. If the test is positive for type B, the flu is not likely to be swine flu. If it is positive for type A, the person could have a conventional flu strain or swine flu. However, the accuracy of these tests has been challenged, and the U.S. Centers for Disease Control and Prevention (CDC) has not completed their comparative studies of these tests. However, a new test developed by the CDC and a commercial company reportedly can detect H1N1 reliably in about one hour; the test was formerly only available to the military. In 2010, the FDA approved a commercially available test that could detect H1N1 within four hours. Most of these rapid tests are based on PCR technology. Swine flu is definitively diagnosed by identifying the particular antigens (surface proteins) associated with the virus type. In general, this test is done in a specialized laboratory and is not done by many doctors' offices or hospital laboratories. However, doctors' offices are able to send specimens to specialized laboratories if necessary. Because of the large number of novel H1N1 swine flu cases that occurred in the 2009-2010 flu season (the vast majority of flu cases [about 95%-99%] were due to novel H1N1 flu viruses), the CDC recommended only hospitalized patients' flu virus strains be sent to reference labs to be identified. H3N2v flu strains and other flu virus strains are diagnosed by similar methods. The best treatment for influenza infections in humans is prevention by vaccination. Work by several laboratories has produced vaccines. The first H1N1 vaccine released in early October 2009 was a nasal spray vaccine that was approved for use in healthy individuals ages 2-49. However, the use of nasal spray has not been recommended since 2016. The injectable vaccine, made from killed H1N1, became available in the second week of Oct. 2009. This vaccine was approved for use in ages 6 months to the elderly, including pregnant females. The CDC approved both of these vaccines only after they had conducted clinical trials to prove that the vaccines were safe and effective. Flu shot: Soreness, redness, minor swelling at the shot site, muscle aches, low-grade fever, and nausea do not usually last more than about 24 hours. The flu shot (vaccine) is made from killed virus particles so a person cannot get the flu from a flu shot. However, the nasal spray vaccine contains live virus that have been altered to hinder its ability to replicate in human tissue. People with a suppressed immune system should not get vaccinated with the nasal spray. Also, most vaccines that contain flu viral particles are cultivated in eggs, so individuals with an allergy to eggs were cautioned about getting the vaccine unless tested and advised by their doctor that they are cleared to get it . However, more refined vaccine preparations have contained very few egg allergens, so the egg allergy factor of vaccines has been almost eliminated. Like all vaccines, rare events may occur in some rare cases (for example, swelling, weakness, or shortness of breath). About one person in 1 million who gets the vaccine may develop a neurological problem termed Guillain-Barré syndrome, which can cause weakness or paralysis, difficulty breathing, bladder and/or bowel problems, and other nerve problems. If any symptoms like these develop, see a physician immediately. Several antiviral agents have been reported to help prevent or reduce the effects of swine flu. The most used are zanamivir (Relenza) and oseltamivir (Tamiflu), both of which are also used to prevent or reduce influenza A and B symptoms. These drugs should not be used indiscriminately, because viral resistance to them can and has occurred. Also, they are not recommended if the flu symptoms already have been present for 48 hours or more, although hospitalized patients may still be treated past the 48-hour guideline. The CDC has suggested in their guidelines that pregnant females can be treated with the two antiviral agents. Severe infections in some patients may require additional supportive measures such as ventilation support and treatment of other infections like pneumonia that can occur in patients with a severe flu infection. Two other new antiviral drugs (Rapivab and Xofluza) may also be used under certain conditions. Some researchers suggest the data on Tamiflu and Relenza is not correct and suggest the antivirals are not effective. Diarrhea, skin infections, hallucinations, and/or altered behavior may occur as side effects of this drug. the physician decides that IV therapy is appropriate due to other circumstances. drug delivery by a route other than IV is not expected to be dependable or is not feasible. Another new drug, baloxavir marboxil (Xofluza), is an oral antiviral approved in 2018 for use in children 12 years and older. In 1976, there was an outbreak of swine flu at Fort Dix. 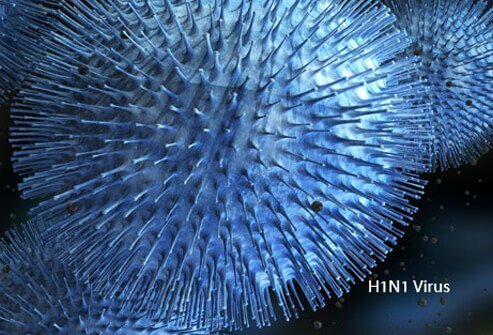 This virus was not the same as the 2009 H1N1 outbreak, but it was similar insofar as it was an influenza A virus that had similarities to the swine flu virus. There was one death at Fort Dix. The government decided to produce a vaccine against this virus, but the vaccine was associated with rare instances of neurological complications (Guillain-Barré syndrome) and was discontinued. Some individuals speculate that formalin, used to inactivate the virus, may have played a role in the development of this complication in 1976. One of the reasons it takes a few months to develop a new vaccine is to test the vaccine for safety to avoid the complications seen in the 1976 vaccine. Individuals with active infections or diseases of the nervous system are also not recommended to get flu vaccines. Early in the spring of 2009, H1N1 flu virus was first detected in Mexico, causing some deaths among a "younger" population. It began increasing during the summer 2009 and rapidly circulated to the U.S. and to Europe and eventually worldwide. The WHO declared it first fit their criteria for an epidemic and then, in June 2009, the WHO declared the first flu pandemic in 41 years. There was a worldwide concern and people began to improve in hand washing and other prevention methods while they awaited vaccine development. The trivalent vaccine made for the 2009-2010 flu season offered virtually no protection from H1N1. New vaccines were developed (both live and killed virus) and started to become available in Sept. 2009-Oct. 2009. The CDC established a protocol guideline for those who should get the vaccine first. By late December to January, a vaccine against H1N1 was available in moderate supply worldwide. The numbers of infected patients began to recede and the pandemic ended. However, a strain of H1N1 was incorporated into the yearly trivalent vaccine for the 2010-2011 flu season because the virus was present in the world populations. As stated in the first section of this article, a new strain of swine flu, (H3N2)v, was detected in 2011; it has not affected any large numbers of people in the current flu season. However, another antigenically distinct virus with the same H and N components (termed H3N2 (note no "v") has caused flu in humans; viral antigens were incorporated into the 2013-2014 seasonal flu shots and nasal spray vaccines. In India in 2015-2016, a large outbreak of swine flu killed more than 1,900 people. During 2016, the numbers of infected people and deaths due to swine flu dropped, but now in 2017 there is a marked resurgence of the disease. The new outbreak of swine flu that began in January 2017 has resulted in 22, 186 people being diagnosed with the infection. There have been 1,094-recorded deaths in 8 months, and the spread of the infection shows no signs of slowing. In the first three weeks of August 2017, 342 deaths were due to swine flu. Unfortunately, private hospitals and clinics do not have to report the number of swine flu diagnoses or deaths, so it is possible according to one medical director of a private clinic, that the current statistics represent "possibly just the tip of the iceberg." In the U.S., the 2017-2018 flu season was termed a high severity season by the CDC because an estimated 80,000 people died of flu and its complications. As in previous recommendations, all children aged 6 months to 8 years of age who receive a seasonal influenza vaccine for the first time should receive two doses. Children who received only one dose of a seasonal influenza vaccine in the first influenza season should receive two doses rather than one in the following influenza season. A newly approved inactivated trivalent vaccine containing 60 mcg of hemagglutinin antigen per influenza vaccine virus strain (Fluzone High-Dose [Sanofi Pasteur]) is an alternative inactivated vaccine for people 65 years of age and older. The CDC occasionally makes changes and updates its information on vaccines and other recommendations about any current flu pandemics. The CDC states, "for the most accurate health information, visit http://www.cdc.gov or call 1-800-CDC-INFO, 24/7." Caregivers should check the vaccine package inserts for more detailed information on the vaccines when they become available. The CDC says that a good way to prevent any flu disease is to avoid exposure to the virus; this is done by frequent hand washing, not touching your hands to your face (especially the nose and mouth), and avoiding any close proximity to or touching any person who may have flu symptoms. Since the virus can remain viable and infectious for about 48 hours on many surfaces, good hygiene and cleaning with soap and water or alcohol-based hand disinfectants are also recommended. Some physicians say face masks may help prevent getting airborne flu viruses (for example, from a cough or sneeze), but others think the better use for masks would be on those people who have symptoms and sneeze or cough. Patients with high-risk factors should discuss flu symptoms and when to use antiviral medications; doctors should provide a prescription for the antiviral drug for the patient to use if the patient is exposed to flu or develops flu-like symptoms without having to go in to see the doctor. "Watchful waiting" was added as a response to taking antiviral medications, with the emphasis on the fact that those people who develop fever and have a preexisting health condition should then begin the antiviral medication. The antiviral medications are the first-line medicines for treatment of novel H1N1, H3N2, and H3N2v flu, and many viruses are to date susceptible to Tamiflu, Relenza, Rapivab, and Xofluza. In general, preventive measures to prevent the spread of flu are often undertaken by those people who have symptoms. Symptomatic people should stay at home, avoid crowds, and take off from work or school until the disease is no longer transmittable (about two to three weeks) or until medical help and advice is sought. Sneezing, coughing, and nasal secretions need to be kept away from other people; simply using tissues and disposing of them will help others. Quarantining patients is usually not warranted, but such measures depend on the severity of the disease. The CDC recommends that people who appear to have an influenza-like illness upon arrival at work or school or become ill during the day be promptly separated from other people and be advised to go home until at least 24 hours after they are free of fever (100 F [37.8 C] or greater), or signs of a fever, without the use of fever-reducing medications. The novel H1N1 swine flu disease takes about seven to 10 days before fevers stop, but research data suggests waiting until the cough is gone since many people are still infectious about one week after fever is gone. However, the CDC did not extend their recommendations to stay home for that extra week. Although vaccination is the best way to prevent the swine flu, there may be times in the future when the swine flu vaccine may not be available. There are no shortages of the trivalent flu vaccine that contains H1N1 antigens. However, during the 2009 H1N1 pandemic, this situation did occur so people wanted to know what they could do to protect themselves. If, in the future, vaccine supplies do not meet demands, there are some things people can do to try and prevent infection. Without vaccination, the best strategy is to not allow any virus type to contact a person's mucus. Quarantining any virus-infected people is an extreme measure that may work in some instances (for example, China used this method), but even with quarantining, the virus may still spread by people who have minimal or no symptoms. The next step, that is easier to be implemented by individuals, is for people with the disease to self-quarantine until they become noninfectious (about seven to 10 days after flu symptoms abate). Infected people can wear surgical masks to reduce the amount of droplet spray from coughs and sneezes and throw away contaminated tissues. Unfortunately, these approaches depend on the compliance of many other people, and the likelihood that such methods will be highly successful in preventing flu virus infections, at best, is only fair. Such methods did not stop the 2009 H1N1 pandemic, although they may have some benefit for a few individuals. Kill or inactivate the virus before it reaches a human cell by using soap and water to clean your hands; washing clothing and taking a shower will do the same for the rest of your body. Use an alcohol-based hand sanitizer if soap and water are not readily available, and use sanitizers on objects that many people may touch (for example, doorknobs, computer keyboards, handrails, phones), although some researchers suggest that such sanitizers are generally ineffective. Do not touch your mouth, eyes, nose, unless you first do items 1 or 2 above. Avoid crowds, parties, and especially people who are coughing and sneezing (most virus-containing droplets do not travel more than 4 feet, so experts suggest 6 feet away is a good distance to stay). If you cannot avoid crowds (or parties), try to remain aware of people around you and use the 6-foot rule with anyone coughing or sneezing. Do not reach for or eat snacks out of canisters or other containers at parties. Avoid touching anything within about 6 feet of an uncovered cough/sneeze, because the droplets that contain virus fall and land on anything usually within that range. Studies show that individuals who wear surgical or N95 particle masks may prevent inhalation of some H1N1 virus, but the masks may prevent only about 50% of airborne exposures and offer no protection against surface droplets. However, masks on H1N1 infected people can markedly reduce the spread of infected droplets. These six steps can help prevent individuals from getting H1N1 and other types of infection, but for many people, adherence to them may be difficult at best. However, there are some additional strategies that may also help prevent viral infections in unvaccinated people according to some investigators. Saline nasal washes and gargling with saline (or a commercial product) as a way to reduce or eliminate viral virus from mucus membranes has been suggested. Proponents of these methods base their rationale on the fact that flu viruses usually take about two to three days to proliferate in nasal/throat cells. While nasal washes and gargling may be soothing to some people, there are no studies that indicate H1N1 or other viruses are killed, inactivated, or completely removed by these methods; conversely, there are no data suggesting these methods cannot have any effect on H1N1. However, with long-term nasal washes using Neti pots, sinus infection with other pathogens may be encouraged. If a person is next to you or near (within 6 feet) and is coughing/sneezing, ask the flight attendant to offer the person a mask. If there are available seats 6 feet or more away from the coughing/sneezing person, ask to change your seat (planes are good means of travel because the air is recirculated through HEPA filters that can capture viruses, but even the filters will not help if people touch areas where droplets have landed; HEPA filters are usually not available in buses, cars, ships, or trains). Turn away from the coughing/sneezing person and turn the air vent toward the person to blow the droplets away from yourself. Variations of her suggestions may be applicable in many different social or work, or travel situations, but there are no data to prove these methods are effective. In addition, common-sense precautions such as not drinking or eating things touched by others, avoiding casual physical contacts (for example, handshakes, social hugs or kisses, public water fountains [these are OK if you touch nothing and lips only touch flowing water], banisters on stairways, and restroom door handles) will limit exposure to H1N1 and other viruses. Again, these common-sense suggestions lack data substantiation. Many investigators suggest that people stay well hydrated, take vitamins, and get plenty of rest, but these precautions will not prevent H1N1 or other viral infections, although they may help reduce the effects of infection by strengthening the person's immune system to fight infection. Similarly, current antiviral medications (described in the preceding section) act on H1N1 and other viruses that have already infected cells; they work by preventing or reducing viral particles from aggregating and being released from infected cells. Timing is important; if only a few cells are infected and the antiviral medications are administered quickly (usually before flu symptoms develop or within 48 hours), the viruses are reduced in number (they cannot easily bud out from the cell surface), so few, if any, other respiratory or mucus membrane cells become infected. This can result in either no flu symptoms or, if a larger number of cells were initially infected, less severe symptoms. The overall effect for the person is that the H1N1 or other viral infection was prevented (it was not; the symptoms were prevented from developing) or that symptoms were reduced. In the strictest sense of the word prevention, even effective vaccines do not "prevent" infections. What they do accomplish is to alert the immune system to be on guard for certain antigens that are associated with a specific disease-causing agent (for example, H1N1 virus, pneumococcal bacteria). When the agent first infects the host, its antigens are recognized, and these cause a rapid immune response to occur that prevents the pathogen from spreading and developing symptoms in the host. People, including physicians and researchers, often term this complex response to vaccination as "prevention of infection," but what actually occurs is the prevention of further infection so well that symptoms do not develop or are minimal in the host. In summary, if H1N1 or other viruses fail to contact cells they can infect, the disease will be prevented. As stated above, this is difficult, but not impossible, to do in almost all societies. Prevention of flu symptoms of infection is possible with antiviral medications if these are given very early in the infection. There are many other methods that may reduce the chance of getting the virus on a person's mucosal surface, but most methods have not been backed up with objective data. Most doctors and investigators suggest that items that help boost or allow the immune response to function well will help people resist H1N1 and other viral infections and reduce symptoms, but these also do not prevent infections. Consequently, while waiting for a specific antiviral vaccine to be developed or become available, there are some ways individuals can improve their chances of preventing or reducing the symptoms of flu virus infections. All of these suggestions apply to H3N2v-caused swine flu as well. Because H3N2v flu has been more closely related to pigs, pig farming and county fairs, people who are at higher risk (see above) should avoid contacting pigs in these settings. There are many flu "cures" and "treatments" described on the Internet (for example, how cayenne pepper, menthol, or ginseng can be used to treat the flu); before using any of these substances, check with a doctor. However, there are many over-the-counter medications, such as naproxen (Aleve), ibuprofen (Advil and others) and acetaminophen (Tylenol), to reduce fever and discomfort, lozenges to sooth a sore throat, and decongestants to help manage mucus production and coughing. These medications help manage flu symptoms but do not cure the viral disease. Yes. An epidemic is defined as an outbreak of a contagious disease that is rapid and widespread, affecting many individuals at the same time. The swine flu outbreak in Mexico fit this definition. A pandemic is an epidemic that becomes so widespread that it affects a region, continent, or the world. On June 11, 2009, WHO officials determined that H1N1 2009 influenza A swine flu reached WHO level 6 criteria (person-to-person transmission in two separate WHO-determined world regions) and declared a swine flu pandemic, the first flu pandemic in 41 years. The H1N1 flu reached over 200 different countries on every continent except Antarctica in the 2009-2010 flu season; fortunately, the severity of the disease did not increase. The following is the CDC data for mortality and morbidity of the 2009 epidemic in the US: final estimates were published in 2011 and state that from Apr. 12, 2009, to Apr. 10, 2010 approximately 60.8 million cases (range: 43.3-89.3 million), 274,304 hospitalizations (195,086-402,719), and 12,469 deaths (8868-18,306) occurred in the United States due to H1N1. An outbreak in India that became widespread in that country lasted until late 2016. However, in 2017 another outbreak occurred. In general, the majority (about 90%-95%) of people who get the disease feel terrible (see symptoms) but recover with no problems, as seen in patients in Mexico, the U.S., and many other countries. People with suppressed immune systems historically have worse outcomes than uncompromised individuals; investigators suspect that as swine flu spreads, the mortality rates may rise and be high in this population. Current data suggest that pregnant individuals, children under 2 years of age, young adults, and individuals with any immune compromise or debilitation are likely to have a worse prognosis. Complications of swine flu may resemble severe viral pneumonia or the SARS (severe acute respiratory syndrome caused by a coronavirus strain) outbreak in 2002-2003 in which the disease spread to about 10 countries with over 7,000 cases, caused over 700 deaths, and had a 10% mortality rate. At the beginning of the pandemic, the numbers of people with flu-like illness were higher than usual and the illness initially affected a much younger population than the conventional flu. As the pandemic progressed, more young children became infected than usual, but the mortality statistics became more similar to the conventional flu mortality rate, with an older population (especially ages 50-64) having the highest death rate. Pneumonia (viral and secondary bacterial pneumonia), is the most serious complication of the flu as it can cause death. Other complications include sinus and ear infections, asthma exacerbations, and/or bronchitis. United States. Centers for Disease Control and Prevention. "Frequently Asked Flu Questions 2017-2018 Influenza Season." Updated: Apr 11, 2017. United States. Centers for Disease Control and Prevention. "Influenza (Flu)." Aug. 8, 2018. <https://www.cdc.gov/flu/swineflu/index.htm>. United States. Centers for Disease Control and Prevention. "Summary of the 2018-2018 Influenza Season." Nov. 2, 2018. <https://www.cdc.gov/flu/about/season/flu-season-2017-2018.htm>. United States. Centers for Disease Control and Prevention. "What You Should Know About Flu Antiviral Drugs." Jan. 5, 2017. <https://www.cdc.gov/flu/antivirals/whatyoushould.htm>. United States. Centers for Disease Control and Prevention. "Influenza (Flu): Weekly U.S. Influenza Surveillance Report." Mar. 18, 2016. <http://www.cdc.gov/flu/weekly/>. Are you concerned about contracting swine flu? Has it affected your travel plans? What symptoms and signs did you experience with swine flu? What treatment did you receive for swine flu? Is your cough caused by a cold, flu, pneumonia or something else? Learn causes of respiratory infection like bronchitis, pneumonia, SARS, bird flu, and more. Cold or Flu: How Do You Know? Learn common symptoms of a cold and the flu. Discover the difference between a cold and the flu. Read about cold and flu treatments such as over-the-counter medicines. Fight cold and flu with foods that boost and improve your immune system. Reach for bright-colored antioxidant and vitamin-rich fruits and vegetables such berries, broccoli, garlic, ginger, tea and more for vibrant health. The flu shot is safe for women who are pregnant. The flu shot not only protects the woman from illness, but it also protects the unborn baby. The flu shot is the protection against the flu if you are pregnant. The flu shot is safe for Pregnant women.